The other day, we went out grocery shopping. To be different, (and to spend a gift card I got a Christmas), we went to Trader Joes. Now, I like my food healthy, and reasonably priced, but I rarely shop at TJ's because they are WAAAAAAAY across town and usually bustling with uptight yuppies. Justin, me, and the kids braved TJ's early-ish Saturday morning. We bought some fruit, tortillas, and a package of lamb chops. I was hoping for some pork, but apparently, they don't carry pork. 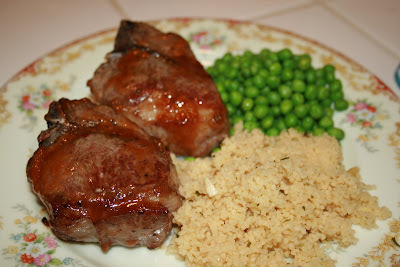 I was a tad bummed about the pork, but seeing the lamb lifted my spirits. I only get lamb a few times a year, usually on special occasions when we go out to eat. 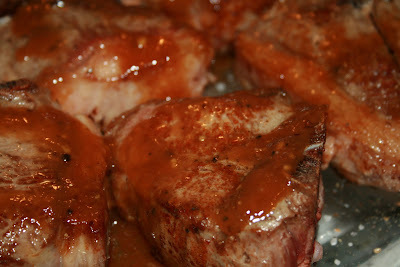 Seeing these chops got me thinking about how I would prepare them. I remember the last time I fixed lamb at home, I pan-fried it. It was tough. It was muttony. I know lamb has a very distinct fragrance and flavor, but that time was Not Good. 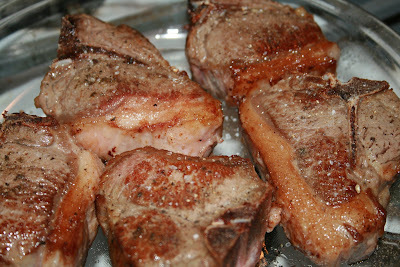 I was hesitant to pan fry again, but only searing in the pan and finishing in the oven kept these chops tender. I would even try changing up the sauce to use red wine. I think the next time I make this, I will add some chopped up fresh herbs to the sauce, too. 2. Heat olive oil in a frying pan. 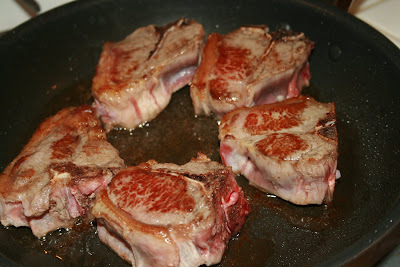 Sear chops 3-4 minutes per side. 3. Remove chops and let rest in an oven-safe dish. Season both sides of meat to taste with salt, pepper, and thyme. 4. Pour sherry into frying pan. You will probably want to turn off the gas if you have a gas stove. The pan is very hot so the addition of cool liquid will cause a lot of splattering. Be careful not to get burned by that. Stir and scrape to dissolve any brown bits. 5. Add dijon mustard and lemon juice to pan. 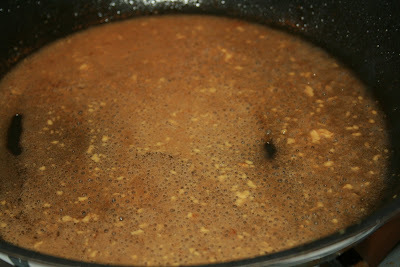 Stir well and reduce until syrupy and glossy. 6. Pour sherry demiglaze over the lamb chops. 7. Put dish into oven and roast for 8-10 minutes. 10 minutes should get you to medium doneness. 8. Serve with a veggie and a heap of toasted pine nut couscous.